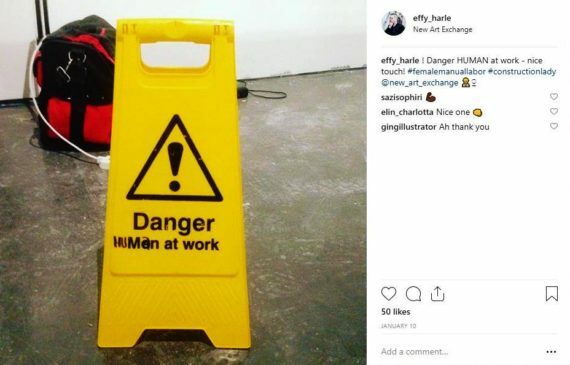 Hello, and welcome to my blog, where I write stuff about being and becoming an art technician; failing and succeeding in an environment which is often male-dominated. But more than anything else, this blog is me, looking for my tribe. I know you’re out there! Viewing single post of blog Women art technicians unite! Come April, when the news of the bursary was doing the rounds on social media, it dawned on me; this might be a much bigger project than I intended to take on. I was pretty stunned by the prospect of, well, not knowing what the heck I was doing. I felt pretty alone with it all and largely out of depth. I wanted to create a research project about the lack of female technicians but the last time I did any kind of ‘academic’ research was on my fine art course, where tutors were proud of the fact that we didn’t have to write a thesis and all of our written coursework was done in bite-sized essays. 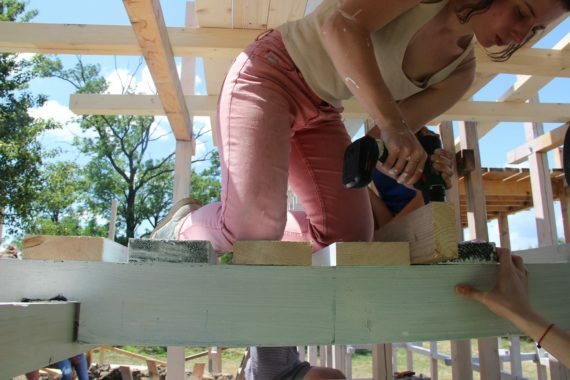 At this point, I envisioned my project to take the form of academic research, much like a thesis with case studies and a report, but at the same time I also wanted to meet fellow practitioners outside of my city to create a network of practitioners and organisations that support the ‘feminist building project’. In the first few weeks of April, I meet with individuals who would be able to help with methodology, as I was terrified of doing the ‘wrong’ thing. I wanted to get a clear plan in my head of how I would build a project up. The first of these sessions took place in London where I met with Beth Bramich, Research Coordinator of Afterall. I had known Beth back from university and knew that she is a well of knowledge when it comes to navigating the intersections of research and contemporary art world. We met for a coffee at the Southbank Centre and chatted about a lot of things; from anxieties around working in the arts to what the best pitch looks like when you approach someone with your ideas. She has introduced me to what a literature review is and whether it might be useful to me to establish a theoretical foundation. We spoke about how I might get started by writing and sending a survey to a small number of people which would serve as my initial data. This small survey then could be followed up with a number of case studies. Beth had signposted me to various resources, including a handy guide on ‘Writing a research proposal’ and pointed out the potential to use this opportunity to forge partnerships. Beth and I discussed what outcomes I might work towards with the project and boiled it down to three key targets; creating a network of practitioners, a collection of case studies and survey, finally a policy document which recommends best practice for UK art institutions. She recommended looking at existing policy documents, such as a-n’s Paying Artists campaign and Birmingham’s Steamhouse, which was founded following extensive research into maker spaces nationwide. Finally, Beth and I discussed the possibility of applying for further funding in the future, to be able to pay for my time spent on the project. ACE’s new Research and Development Grant seemed like a fitting choice for what I wanted to do. Unfortunately though, applying for more funding means more work to do, even if you don’t succeed, and if you do, more reporting, adding on far more work than it benefits a project in such initial stages. This is why, after some consideration, I decided not to go for the R&D Grant at this point. It seemed more productive to reconsider this later down the line when I had already made some solid progress. One of the main issues I have working on a self-initiated project like this is that although the bursary is great to cover travel costs and to pay for mentoring, it’s not sufficient to subsidise for my time. My current job in April was two days a week which wasn’t enough to cover all my costs. I knew I had to take on more regular work soon, as I didn’t have enough teching jobs at the time to fill in the gaps. This made me worried as I wasn’t sure how to juggle two jobs and manage a project like this at the same time. Throughout April, I continued to seek advice everyone I could around me, but the more people I spoke to, the bigger the project grew until it became so untangled I could hardly see out of it. It was great to sketch up a big, ambitious plan, but I needed to get my bearings on how I would make even a small part of it happen within the given parameters. The project became a hot air balloon, and was about the fly off, without me. Since March 2018 I was part of a feminist artist group called The Ultras, initiated by Eastside Project. The collective met regularly, usually in Birmingham. The Ultras become a sort of grounding for me throughout the year; The Ultras is not an outcome based environment, where you are judged according to your achievements, but a convivial, non-judgemental space to grow the courage to make the steps necessary in our lives as artists, makers, teachers, designers, researchers. I realised that in order to realise this project I need to develop my support structures as an artist and organiser. I will always have multiple jobs to manage and one too many projects to work on, so I need to structure my life in a way that I am supported by ever-growing circles of friends, collaborators, colleagues, and organisations. In a way, I’m talking about an artists’ hierarchy of needs; to put it simply, The Ultras is a perfect example of a group that supports my ‘Self-esteem needs’. I wanted to seek a similar partnership and support group locally as well. I couple of months into my project I became part of New Art Exchange’s Experimentor Programme. As one of their core artists, I receive mentoring and advice on work in progress. Since I had worked at NAE as a freelance technician before, it great to work with them in a different capacity. I was able to work with NAE’s head technician to develop their changeover routines and recruitment. I will continue to consult with them on developing a more comprehensive guide for other galleries to develop a more diverse technical team and more rewarding changeover routines. 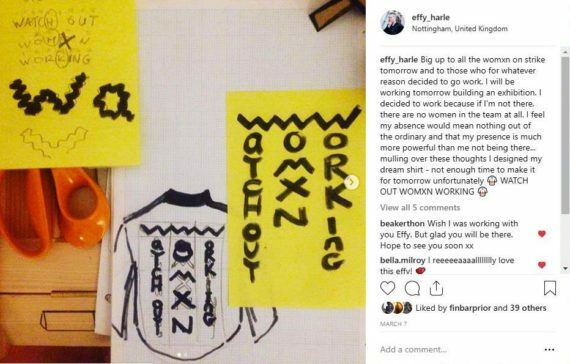 Effy Harle is a creative practitioner based in Nottingham who is currently working on a research project Female Art Technicians in the UK, supported by A-N Artist Bursaries, and recently curated Terra Firma, a solo exhibition by Barbara Mihályi, Centrala Gallery, Birmingham, 2017. Together with Manual Labours and Finbar Prior she has designed and produced the Wandering Womb. 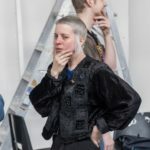 Effy Harle has worked across curatorial, education, production and technician roles at Nottingham Contemporary and Eastside Projects.